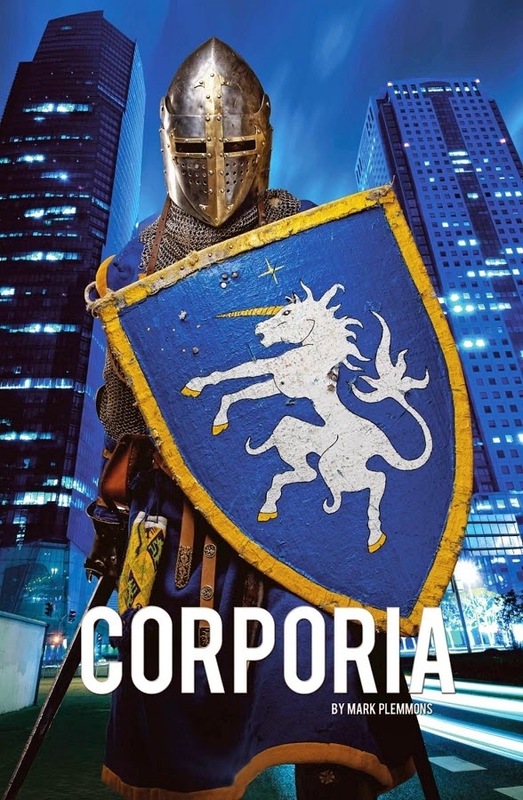 In the default set-up for Corporia, the players take the role of these reborn Knights of the Round Table and their supernaturally-powered allies as members of Knightwatch. This is an elite unit of Watchmen, one of several Private Military and Security Companies (PMSCs) that have contracts to police the various districts of The City. The Watchmen are owned by Valyant, the CEO of which is Lance Martin—the reborn Lancelot, and it is to him that members of the Knightwatch report directly. Aiding both the Knightwatch and Lance Martin are an A.I. called M.E.R.L.I.N. (Master Eye Registrar and Logistical Intelligence Network) and Nimue, Merlin’s apprentice reborn. Most missions assigned to the Knightwatch come about because of M.E.R.L.I.N. monitoring the net or Nimue’s prescience. Knightwatch operatives are expected to act covertly and nearly all have lives other than their Knightwatch assignments. Corporia is specific about the types of characters it wants the players to take, listing some thirteen archetypes. These are Badges (PMSC operatives or private investigators), Hackers, Headhunters (assassins or recruitment specialists), Journos, Knight-Errants (knights of King Arthur reborn, melee specialists), Listers (celebrities), Radicals (opponents to corporate rule), Runners (couriers that combine parkour with wuxia-style martial arts), Sorcerers (techno-mages), Suits (corporate executive), Thinkers (doctors, scientists, experts), Witchers (traditional magic), and Zeroes (labourers and manual service workers). Once this archetype is selected, a player also needs to choose a second, his character’s astrological sign. Fortunately, this is only to define the personality traits rather than as a means of prediction. Each character has four personality traits—three public and one private. For a character born under the sign of Aries, his Public Traits might be Aggressive, Generous to Friends, and Viionary, and his Private Trait might be Addict or Orphan. Essentially, Public Traits can be seen as advantages and the Private Trait as a disadvantage. Either way, roleplaying either type will earn a character Flux Points, the GM being expected to tempt a player with Flux Points to encourage him to give in to his character’s Private Trait. Flux Points can then be spent to improve dice rolls when acting or to shrug off damage. Whenever a player receives or spends Flux Points, he also receives Build Points with which to improve his character. A character also has a ‘Core Competency’, which determines his focus during character generation. ‘Touched’ characters get more to spend on attributes and skills, whilst ‘Fluxed’ characters get less to spend on attributes and skills and more to spend on Supernatural Assets. ‘Gifted’ characters receive a balanced mix of points. All characters receive the same number of points to assign to General Assets. Sorcerers and Witchers must have the ‘Fluxed’ Core Competency in order to possess the Spellcaster asset and be able to learn and cast all spells. ‘Gifted’ characters can have limited spellcasting or psionic ability, or be Hackers capable of immersing themselves fully in the Augmented Reality. Our first sample character is a Knight-Errant, or at least a Knight-Errant to be. Norman Cheeseman, a low level enforcer for the Oseku cartel, an Albanian crime ring that currently runs several district franchises. An ex-prizefighter, Cheeseman was never more than a journeyman fighter and now makes most of his monies doing using his fists and Com/Bat melee weapon. Of late, he has begun to have second thoughts about his choice of career and is beginning to develop a conscience. The mechanics in Corporia use the Flux System. Whilst other dice in the game might be used for rolling damage or other effects, when a character wants to do something, he adds the relevant attribute and skill to a Flux Dice roll—a roll of two six-sided dice, of which he chooses the higher result. Rolls of six enable a player to roll and add, including both dice. Target Numbers range from Easy (5) and Average (7) to Difficult (9) and Hard (11), and beyond… A result of five or more than gains a player a Raise, which gives an additional degree of success. Combat uses the same mechanics, but attacks are rolled against the target’s static Defence Check, for example, versus the target’s Deftness plus Getting Medieval. Damage is rolled according to the weapon used, armour and protection reduces this, and if the result exceeds the target’s Mettle, then damage is inflicted. This is not expressed in the number of points inflicted, but rather as a Wound and hit location penalties in the particular hit location. Optionally, the Director may allow Raises on damage to inflict more Wounds. A character can suffer a number of Wounds equal to twice his Mettle. A range of weapons are included in Corporia. Most of them are fairly generic, though the Raypier is an energy for your Knight-Errants who want to wield lightsabers! It should be noted that even though Corporia is a post-cyberpunk urban fantasy, melee weapons are just as important as firearms, if not more so, as there are Cryptids that are only vulnerable to cold iron. As a post-cyberpunk setting, numerous augmentations are available to purchase, both legally and on the black market. EyePhones and EyePads are legal, whilst Cloak, which inserts nanoprojection units onto the epidermis to distort the visual signature and so fool robots and holographic sentries is not. Augmentations, both physical implants and ingested are part of the setting of Corporia, but not its focus—magic though, is. The magic rules in Corporia are designed to be simple and flexible. There are two types of magic—Sorcery and Witchcraft—and each of these has its own quartet of skills and associated spells. Sorcery has Holography, Kinesis, Metamorph, and Technomancy, whilst Witchcraft receives Charm, Elemental, Perception, and Spiritism. It is possible for a Sorcerer to learn Witchcraft spells and vice versa, but it costs more to purchase ranks in the other type of magic. To cast a spell, a Sorcerer or Witcher adds his Magick and his Sorcery or Witchcraft skill to a standard roll, the Target Number being determined by the spell itself. For example, the TN for the Mindtrick spell from Witchcraft’ Charm Discipline, which allows the caster to make a victim believe a simple suggestion for a few rounds, is 3, whereas the TN for the Sleep spell is 5. If the caster wants to increase the range, duration, or number of targets for a spell, then he only has to increase the TN of any spell by two and he can do this as many times as he wants. For example, the Witcher Elspeth Stephens is attempting to get into a freight holding area. The area outside is being patrolled by a pair of augmented guard dogs and Elspeth wants to put them to sleep. The TN for the Sleep spell is 3, but this is two targets, so the difficulty goes up by two. The spell will last three hours—equal to her Witchcraft (Charm) Discipline—but wants it to last longer. So she also doubles the time and increases the TN by two for a total of 7. In addition to modifying existing spells, a spellcaster can also create new spells in addition to the few listed for each discipline. Unfortunately this section is somewhat underwritten and could have done with an example or two. There are limitations on a caster using magic. Primarily on the number of spells that he can cast per day—equal to his Magcik attribute—before he has to cast with penalties. Both types of spellcasters can use wands, made of artificial materials for Sorcerers and natural materials for Witchers. There are various types of wand available—which feels very Harry Potter-ish—and all can do ranged damage equal to the caster’s Magick attribute. This damage ignores armour, but again, the number of times a caster can do this is limited to his Magick. The default setting for Corporia is The City, to which a whole chapter is devoted—though it would be easy enough for the Director to set his game somewhere of his choosing. With just under a page devoted to each of its Districts, including a general description, a few places of interest, and its government, The City is described in fairly broad details. Broadly based on Tokyo, The City nevertheless feels North American if it has a feel at all. Nevertheless, the differences between Districts will come into play, especially if the Director is running the default Watchmen campaign. Security and policing is contracted to different corporations in different Districts, which can make matters of jurisdiction an issue if Lance Martin wants the player characters to be discreet. An overview of Corporia’s eighteen corporations adds a bit more flavour that the District descriptions might be seen as lacking. For the Director, the author includes a good chapter on both running Corporia and presenting some of Corporia’s deeper background. The general advice on running the game is solid, if familiar to anyone who has read an RPG of late, but a nice touch is that the author actually recommends Robin D. Laws’ Robin’s Laws of Good Gamemastering amongst others. To help create adventures, Corporia provides the G.R.A.I.L. (Goal, Recon, Assault, Infiltration, and Liquidation) model as a structure in which the player characters are briefed or informed of the mission, examine the mission’s initial or primary scene, assault or infiltrate their target, and lastly deal with, or liquidate, the threat. Although the name of the model befits the game, it does feel as if the author is trying just a little too hard. Despite this, there is good advice in this chapter, along with a set of scenario outlines , various adventure hooks, write-ups of the most important NPCs, some example Cryptids—some of them quite creepy, and a guide for the Director to create his own. Physically, Corporia is a small hardback book done in full colour. Overall, it is well written and profusely illustrated, not with artwork though. Rather, the author has used specially posed photographs throughout, with the models using various props. This works for the most part, but in places the art feels a little forced and somewhat generic. This is an extension from the equipment list which itself is also generic. Nevertheless, the writing is light and the RPG is easy to pick up and grasp. Corporia feels like three things. First it feels like a UniSystem RPG as published by Eden Studios with its various archetypes; second, it feels very much like an elevator pitch developed for television; and third, it feels a little like a computer game. Although there is an interesting elevator pitch at its heart, that of post-cyberpunk Once and Future King meets Buffy the Vampire Slayer, the setting itself does not quite do justice to the concept. The City feels slightly too generic, a little too bland, and this undermines the feel of the game. Nor does it help that the equipment list is also bland, which means that it only adds function when it should also be adding flavour and verisimilitude to the game and setting. Although underdeveloped in terms of world building, Corporia is strongest when directly addressing its elevator pitch concept. This it does with a solid set of rules and a set of interesting character options.